I like ice cream in the middle phase. Not too hard but not yet a liquid. When I get a sundae that’s not made with soft serve I have to let it sit for a bit before I eat it. The flavor is missing when it’s too cold. Ah, finished the archive, and now I have fresh Biff in my Feedly! I have always been, and always will be, a fan of the liquid.. Sometimes, I’ll even heat up hot fudge enough to spoon out, but still be cool, just so I can microwave it the rest of the way once it’s on the ice cream. I’ll sometimes add more hot fudge, too.. I have never tasted Vanilla Ice Cream pure. How shall I put this? Ice cream is one of my favorite beverages. 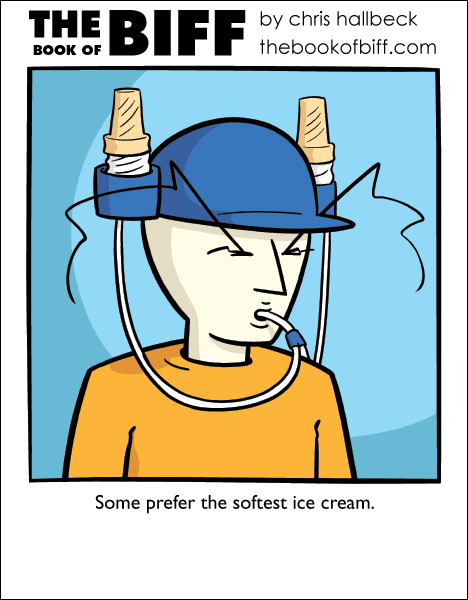 I want a soft-serve cap now.